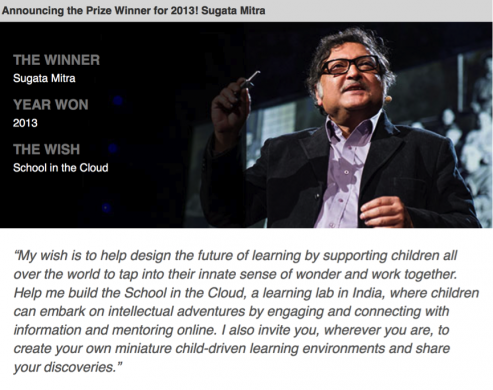 Sugata Mitra made a bold wish when applying for the $1 million TED Prize in 2013. He wanted to create a place where children could learn and teach each other. They would do this by using a school in the Cloud. They are motivated by curiosity. They are given the chance to teach themselves and each other. Sugata was awarded the prize. Here are excerpts from a description of his talk, plus the next steps in the project. You can find more details at the following link. Mitra wants children around the globe, in addition to traditional schooling, to get a chance to participate in self-organized learning. Translation: to spend time in learning environments where they are given the space to explore on their own, make discoveries and share them with their peers. Mitra has a history of research to back up this wish. In 1999, he began what he calls his “hole in the wall” experiment. He carved a hole in a wall in a Delhi slum — about three feet high — and placed a computer in it. Kids had gathered around within a matter of hours and asked Mitra questions about what this thing was. He responded “I don’t know,” and walked away. Soon the kids were surfing the internet – and teaching each other how to do it more effectively. Mitra repeated the experiment 300 miles away, where computers even less familiar. He installed a mysterious computer on the side of a road. Mitra kept testing, seeing if rural students could learn different pronunciation simply by talking into a speech-to-text engine until it understood them. They did it. And then he went even more absurd. He asked: Can Tamil-speaking 12-year-olds learn the biotech of DNA replication by themselves on a street side computer in English? Instead of traditional instructing, she simply gave encouragement. The kids’ test comprehension scores jumped. “We live in a world where, when we want to know something, we can learn it in two minutes,” says Mitra. Mitra isn’t ready to say that, but he is willing to challenge traditional modes of education based on teaching, testing and regurgitation. As Mitra explains, punishments and exams are seen as threats by kids. He says that these are tools no longer needed outside of the age of empire. Mitra urges us all to shift the incentive for education from threat to pleasure. Mitra shared another one of his experiments – the “granny cloud,” a community of retired teachers who Skyped into learning centers and encouraged children with questions and assignments. He calls this type of environment a SOLE — a self-organized learning environment. It’s based on a curriculum of questions that set curiosity free, varying forms of peer assessment and certification without examination. Mitra’s $1 million TED Prize is not a gift – it’s seed money to fund a global initiative toward this vision. 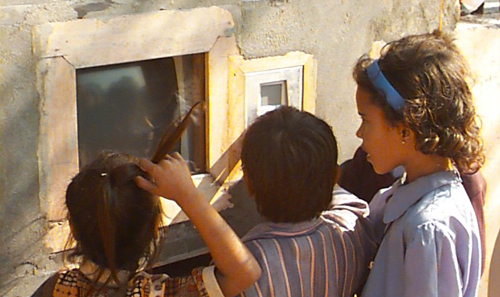 The money will help Mitra break ground on the School in the Cloud in India this very year. This school will serve as both an education and research center to further explore approaches to self-directed learning. It will be managed by cloud technology, but with an adult supervisor always on hand. The plans for the school will be open-sourced. Closing his talk, he shared an anecdote. “A little girl was following me around. I said, ‘I want to give a computer to everyone,’” recalls Mitra. 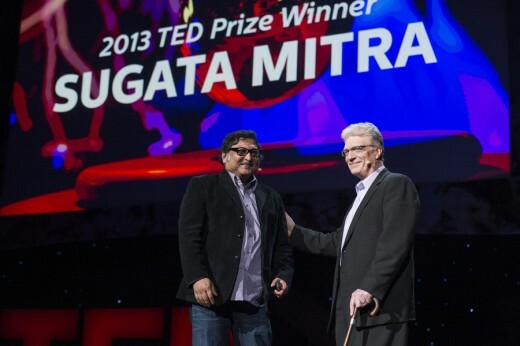 Sugata is pictured here with Ken Robinson after winning the prize.